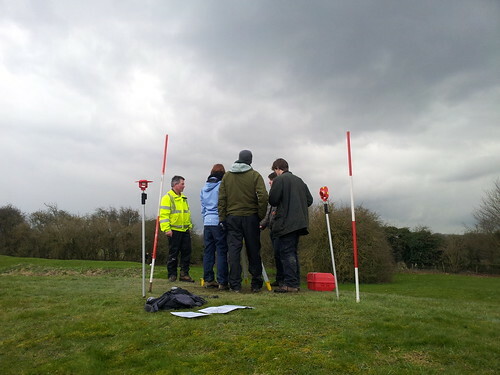 Today was the second day on site for staff and students from the surveying module. 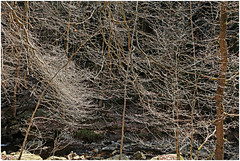 The weather was changeable (to say the least! 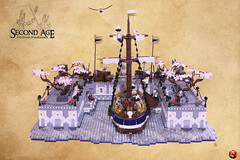 ), but the teams still managed to get almost a full day’s work in. 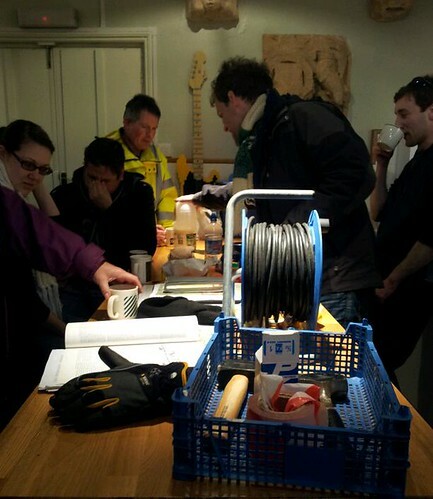 We were all feeling confident as we arrived on site this morning, and the teams set up quickly and smoothly. There was just enough time to take a group snap before everyone ran off to begin their work! Group shot! 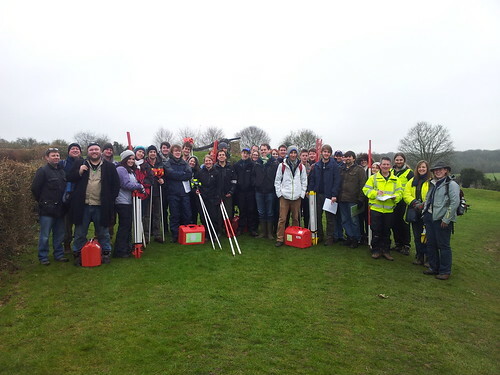 Undergraduate Archaeology and Archaeology/History students and staff at the Basing House Survey, week one. 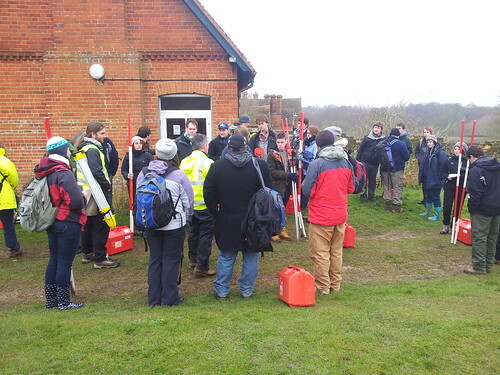 The plan for our week here on site is for the seven teams of students and staff to move gradually through the site, surveying as we go. 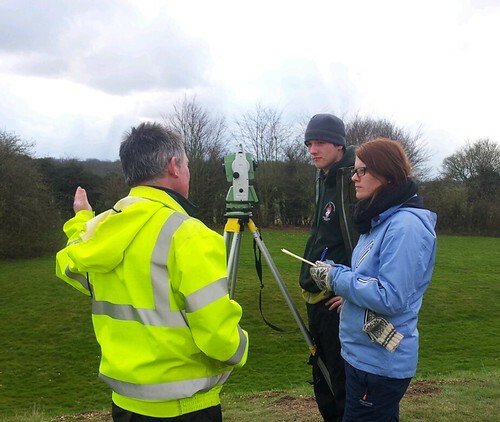 Each team works on a delimited area, using landmarks such as wall and tree lines to mark where the surveying is taking place, identifying also a small overlap with any neighbouring teams. 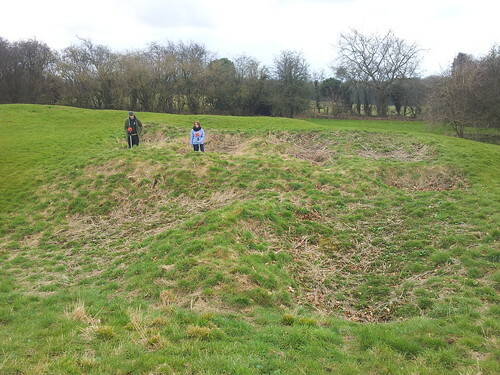 We’re aiming to survey a large part of the site, but Basing House really is very extensive, so we are not sure how far we’re going to get in the time that we have available. Day two of surveying. Tim giving the morning briefing to the students, before separating into teams for the day. 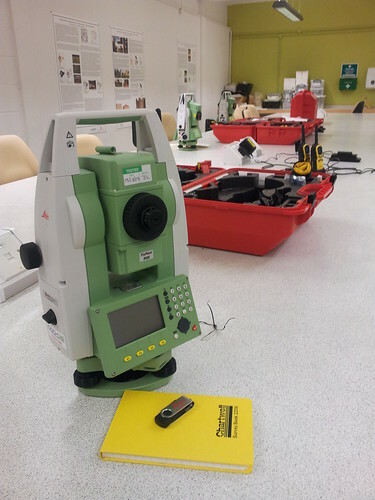 Our seven teams of four students and one staff member are using one total station, and have two prisms, so that every student has an opportunity to take part in each aspect of topographic surveying and building surveying with a Leica. The Leica’s we’re using are brand new (they’re so clean and sparkly), and we’ve been really impressed with how user friendly this new manifestation of the kit is. 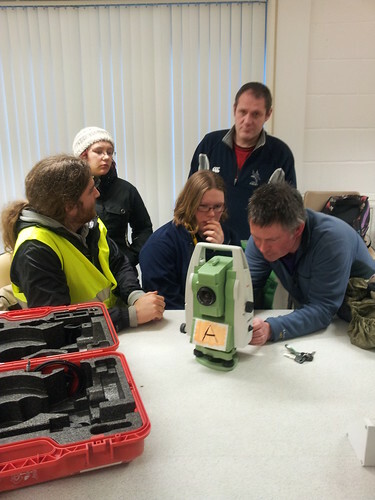 Tim and students plan moving the total station. 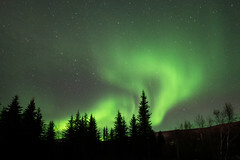 You may notice from the photograph above that the sky was getting darker as the day progressed. The teams were working hard to get the areas in which they were based finished before the rain started. Thunder and lightning pauses the surveying. The dramatic skies did make for some good photos! By three o’clock the weather closed in on us and halted work. We all sheltered in the Bothy, and eventually reluctantly decided to travel back to the University to download the day’s data. There was even some hail as we were driving away from the site! 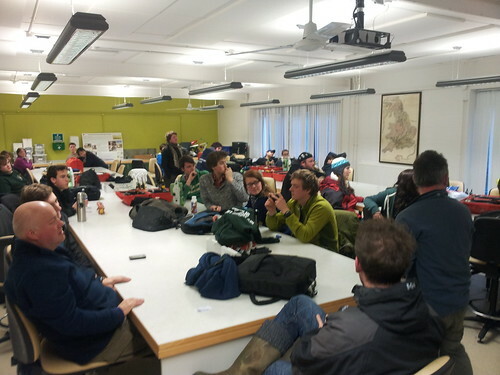 Sheltering from the rain, the teams enjoy a quick cup of tea and discuss surveying tactics. Back at the university, we downloaded the data. There have been a few problems with automatic numbering of stations, but we’ll work round it! Downloading data back at the University. Downloading data from the total station. Total stations awaiting data download. One of the undergraduate teams working on the site has been surveying in the topography of the filled in trenches that we will be excavating this summer. Today, as they were surveying, I took some shots of the team as they provide an excellent scale for the trenches; thanks guys! The trenches we will be excavating this summer. The trenches we will be excavating this summer. 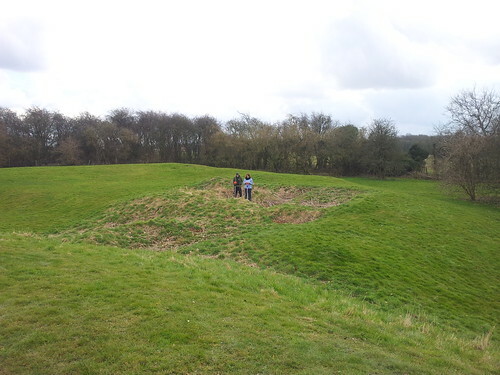 Two of our undergraduate students inadvertently providing a scale for the site! This morning some of the team for the summer excavations met with the education staff based at Basing House to plan some activities for the summer season. We’ve been brainstorming the kinds of things that we could do, students and volunteers meeting public visiting the site. 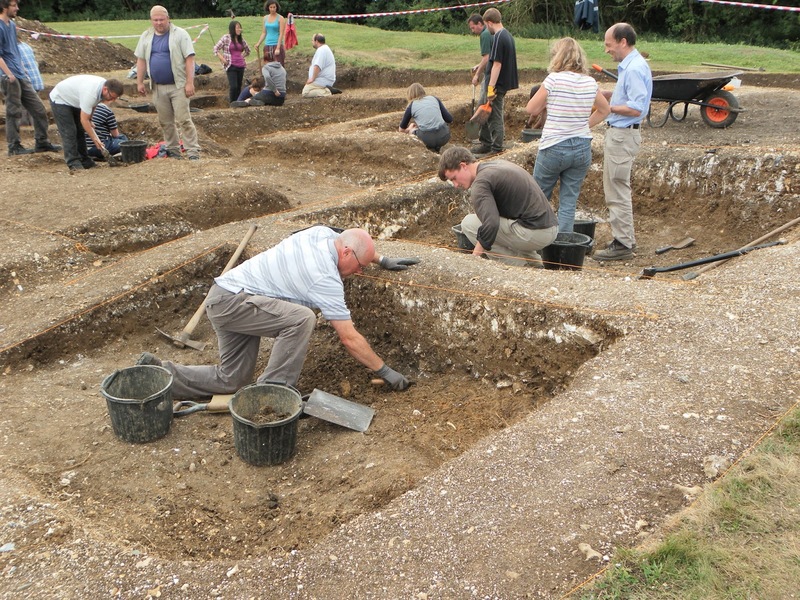 Its really exciting to think that we’ll be here over the period of the Festival of British Archaeology (13th – 28th July) and so we’re hoping to work with Hampshire County Council staff to provide drop in sessions in the last week of the Festival.